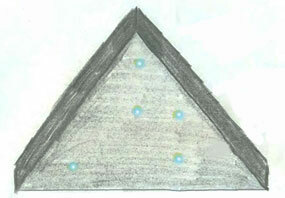 Part 1: Huge Aerial Triangle and Non-Human Entities in Army’s Fort Knox, KY.
J. S. Jones sketched this triangle-shaped aerial craft as he first saw it from his second story Fort Knox Army barracks bedroom window in July 2003 after suddenly being awakened. Illustration for Earthfiles © 2012 by J. S. Jones. 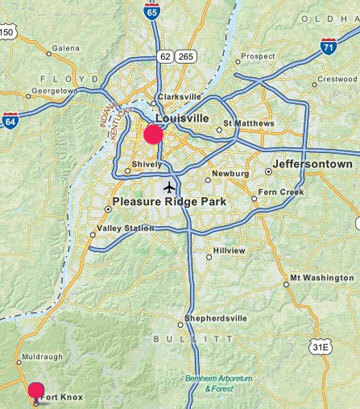 Fort Knox, Kentucky (lower left red circle) is 35 miles southwest of Louisville. For seven decades, Fort Knox has been the U. S. Army's “Home of Cavalry and Armor.” Today at Fort Knox are the 3rd Brigade Combat Team, 1st Infantry Division; Army Reserve Readiness Training Center; 100th Division Headquarters; the 3rd Sustainment Command (Expeditionary) and the Army's Human Resource Center of Excellence. December 11, 2012 Fort Knox, Kentucky - J. S. Jones (pseudonym at request) was born forty-five years ago in the Midwest. By 1985, J. S. had started college, but soon dropped out to enlist in the U. S. Army and began basic training at Fort Knox, Kentucky. Over the next twenty-three years, J. S. would be discharged and later re-enlist more than once in Army or Army National Guard service until his final U. S. Army discharge in early 2008. Previous PostPrevious What’s Causing Mysterious Lights, Loud Booms and Strange Hum in Narragansett Bay, Rhode Island?